FILE - Migrants mainly from Mexico and Central America watch from a border migrant shelter in Tijuana, Mexico, as U.S. President Donald Trump gives a prime-time address about border security Jan. 8, 2019. U.S. President Donald Trump and congressional leaders are meeting again Wednesday, but there were no signs they were ready to compromise over Trump's demand for funding for construction of a barrier wall along the U.S.-Mexican border, a dispute that has led to a 19-day partial government shutdown. 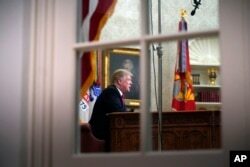 FILE - As seen from a window outside the Oval Office, President Donald Trump gives a prime-time address about border security, at the White House in Washington, Jan. 8, 2018. Trump said on Twitter, "Thank you for soooo many nice comments regarding my Oval Office speech. A very interesting experience!" In another tweet, he reiterated the call to "fix" the southern border. He told reporters, "We have to do what's right at our border." Trump said he still may declare a national emergency to build the wall without congressional approval, adding, "My threshold will be if I can't make a deal with unreasonable people." In their rebuttal, Pelosi and Schumer derided Trump's claim that the U.S.'s southern neighbor would pay for the wall, instead of U.S. taxpayers. 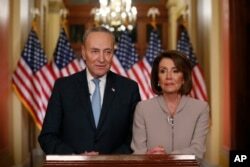 FILE - House Speaker Nancy Pelosi, right, and Senate Minority Leader Chuck Schumer pose for photographers after speaking on Capitol Hill in response President Donald Trump's prime-time address on border security, in Washington, Jan. 8, 2019. Other Democratic senators also said they were unmoved by Trump's demand for a barrier. "I didn't hear the president say anything that would change my mind. We should be re-opening the government," Senator Maggie Hassan of New Hampshire told VOA. "I think we ought to solve this shutdown. It's ridiculous," said Senator Angus King, a Maine independent who caucuses with Democrats. Senator Doug Jones of Alabama said, "We need to dial back the rhetoric and not use fear. Let's talk strictly about border security in the long run, not just a short-term fix. We need to figure out how to get this government open, number one, and fix our borders, number two." Republican Senator John Kennedy of Louisiana called Trump's comments about border security "very appropriate." He said Schumer and Pelosi's support for border security but not a wall was "juvenile ... very disingenuous. I think most Americans understand that it's purely political." Senator John Boozman of Arkansas told VOA he thinks that a compromise might eventually be reached. "I think the president will wind up with not all that he wants," Boozman said, "and Democrats are going to have to give some. I think that's really the solution." Trump said in his address that it is up to Democrats to "pass a spending bill that defends our borders and reopens the government." He suggested the issue could be resolved in a quick meeting, but past discussions at the White House have not ended the stalemate. In their joint response to Trump's speech, Pelosi and Schumer pointed to a number of spending bills lawmakers have already passed that would reopen the government and provide money for border security. They say the shutdown continues only because Trump refuses to drop his demand for $5.7 billion in wall funding. FILE - Two people walk towards metal bars marking the United States border where it meets the Pacific Ocean, in Tijuana, Mexico, March 2, 2016. "Over the years, thousands of Americans have been brutally killed by those who illegally entered our country and thousands more lives will be lost if we don't act right now," Trump said. "This is a humanitarian crisis, a crisis of the heart and a crisis of the soul." Trump accused Democrats of not acknowledging what he calls the "crisis" at the border and says they refuse to support funding for border security and what he calls the "common sense" wall.